This version is available with GPG 1.4 or GPG 2.1. Use the GPG 1.4 versions unless you want to test GPG 2.1 features. Click Windows or Linux for a step-by-step screen recording showing you how to install and use Confidant Mail. GPG 2.1 eventually times out the passphrase in memory, at which time auto-fetch will stop working unless you type the passphrase again. Manually performing a check-send will cause the passphrase prompt to reappear and auto-fetch will resume if it was enabled. You can create ECC keys, but they are not compatible with GPG 1.4. ECC keys are for testing in closed groups at this time. You cannot contact me using an ECC key. My public servers do accept ECC keys. If you install the Windows GPG 2.1 version and want to go back to GPG 1.4, uninstall the 2.1 version first, then install the 1.4 version. notification in earlier versions. Entangled v0.12 peer-to-peer library - derived from v0.1 on Sourceforge. I fixed some bugs. OpenSSL for Windows - you will need this to create certificates and DH parameters for a Windows-based server. DiskCryptor - open source hard disk encryption, a must-have companion for secure email. VeraCrypt - Hard disk encryption tool now supports Windows 8 and 10 EFI partitions. GNU Privacy Guard - the standard public key file and message encryption tool, and the crypto engine of Confidant Mail. TOR anonymity utility - required to use Confidant Mail anonymously. I2P anonymity utility - another anonymous network, also supported by Confidant Mail. 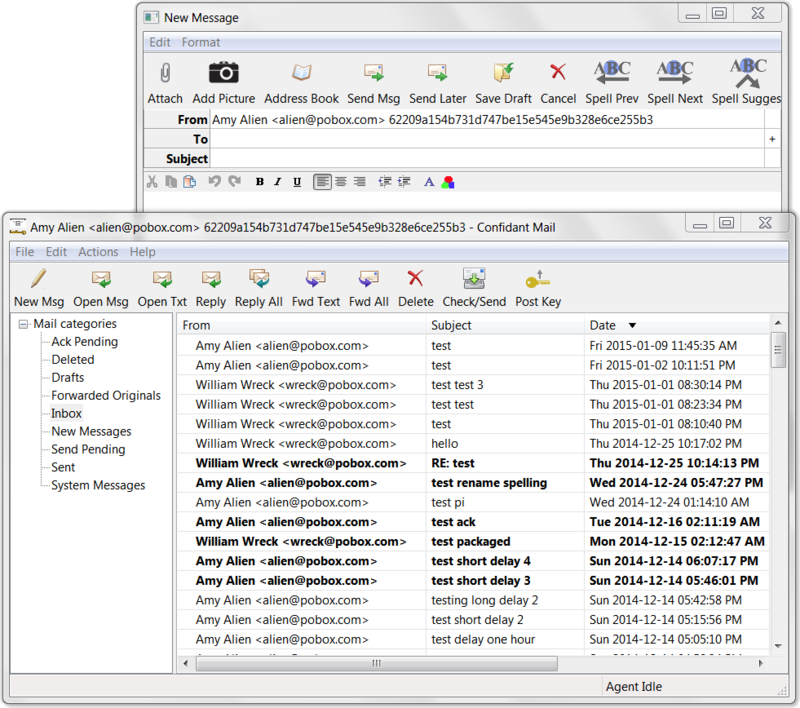 Pidgin IM - instant messaging client, use with OTR below. Off-the-Record Messaging - encrypt your instant messaging. The most secure way to have a real-time chat. Overlays onto Pidgin above. Openfire chat server - the server for Pidgin OTR. Duplicati backup - open source encrypted cloud backup. Version 0.41 corrects a bug with key refreshing (exception when the key is not available), fixes revoked subkey deletion in the key rotation, and makes a few cosmetic changes.